To ensure we can answer any questions regarding Canadian history you may have when we return, today we visited the Canadian Museum of Civilisation. The museum is three floors in total and gives a great overview of Candian history and culture. The first floor covers the history of the First Nations People – Inuits and Canadian Aboriginals (not Eskimoes and Indians), with lots of carvings, artwork and information on how European settlement affected their lives and culture. The second floor currently has a feature on the history of Ice Skating/Hockey and a display of Canadian craft. The third floor has recreated scences from different Eurpoean settlements begining with the Vikings, the Arcadians and the French and British whalers. A series of displayes also showed the battles beween the British and French colonised areas culminating in the Treaty of Paris which ceded New France to Britain. The frozen river you see in this photo also forms the border betwen Ontario and Quebec meaning Ottawa has as much in common with Albury-Wodonga as it has with Canberra. We crossed two of the six briges spaning the border today. 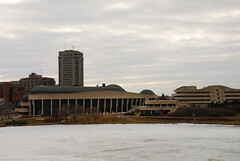 Standing regally over the Ottawa River, Canda’s Parliament House is the foundation of the capital and an architectual art work. The Hill has three blocks, the most prominent, Centre Block, houses the Federal Parliament and the Library of Parliament. Tours run regularly so we joined one for a behind the scenes look at the Senate, the Library and the Peace Tower. Unfortunatley the Parliament building was destroyed by fire in 1916, however the Library was saved and is all that remains of the original building that was completed in 1878. The Library was my favourite part of the Parliament, however we were not able to take photos. Simon did capture a great shot of the Senate and you can check it out of Flickr. We also rode the lift up into the Peace Tower to a viewing platform below the clockface for a bird’s eye perspective of Ottawa and also caught a bit of debate in the House of Commons. It was a grey and rainy morning in Toronto so we were very thankful to Boris (landlord’s son) for driving us into the Toronto bus station for our five hour journey to Ottawa. Not much to note about the bus trip so shall skip straight to our arrival. We arrived safely in Ottawa around 2:30pm, a little nervous however as neither of us had bothered to check how to get from the bus terminal to the hostel. No need to worry as a fellow traveller overheard our predicament and helped us find our way. The hostel is the Old Carelton County Jail, operating from 1862 to 1972 and was the site of Canada’s last public hanging. 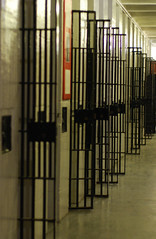 The jail was closed as it’s conditions were deemed inhumane for Canada’s worst crimials, despite this it is considered fit for budget minded foreigners. With the day dwindling away we took a stroll around Ottawa to familarise ourselves and stopped at the Byward Market for a COffee and a Beavertail (a deepfried pastry shaped like a beaver’s tail covered in cinnamon and sugar – mmm yum). Off to bed early though as we have a big day tomorrow exploring Parliament Hill, the National gallery amoung other things. On that note, we will now be adding content on a much more regular basis. Be sure to check in on us as we hope to post once a day.